Theater Reviews: "References To Salvador Dali Make Me Hot" and "Fortune's Child"
Actors Jessica Garrett and Kaveh Haerian in "References To Salvador Dali Make Me Hot" at Single Carrot Theatre. Baltimore is bustling with winter theater productions; so many that today, theater critic J. Wynn Rousuck reviews a couple of them. Two very different plays about the difficulties of loving and letting go have opened on Baltimore’s smaller stages. One is a Baltimore premiere, the other a world premiere. The Baltimore premiere -- Jose Rivera’s “References to Salvador Dali Make Me Hot” at Single Carrot Theatre -- is odder, more adventuresome and more successful. The oddity begins with the title. Not only is this not a play about Salvador Dali, it contains only a few passing references to the surrealist painter. The important word in the title is “hot.” “Hot” takes on multiple meanings in this intriguing, inventive, playful and disturbing work. 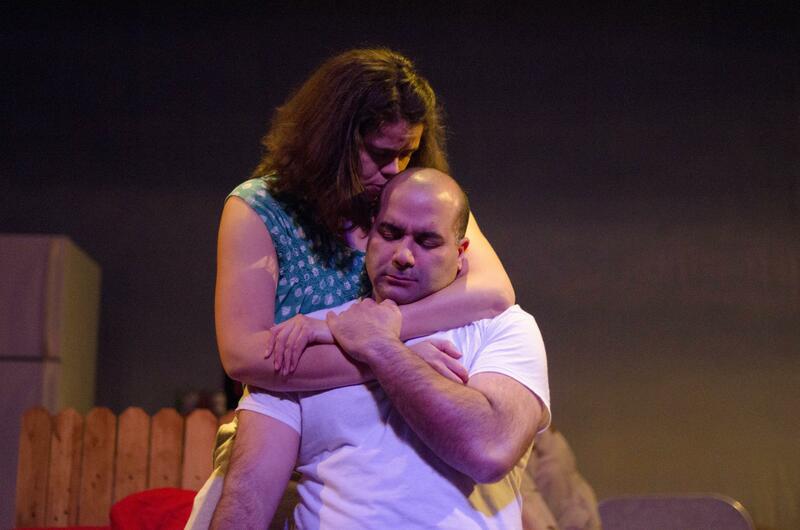 There’s “hot” as in temperature: The play is about a married couple in a small, hot, California desert town. The wife, Gabriela – played by Jessica Garrett -- feels trapped and isolated in the desert. Gabriela’s husband, Benito, is a career soldier who fought in the heat of another desert in the Persian Gulf War. The Army keeps Benito away from home for long stretches. Then, there’s “hot” in the sexual sense. In Rivera’s imaginative play, “hot” refers to the chemistry – and tension – between husband and wife, as well as the heat an adolescent neighborhood boy feels for Gabriela. “Hot” even refers to the lust – both lascivious and blood lust – that a coyote feels for Gabriela’s pet cat. Yes, a coyote and a cat are characters in “References to Salvador Dali Make Me Hot.” The moon -- played by Kaveh Haerian -- is also a character, watching and commenting on the action and occasionally interacting with the other characters. Rivera’s language is poetic – not just for the supernatural characters, but also for the human characters. The Puerto Rican-born playwright studied with Gabriel GarcÌa Marquez, and magic realism is threaded throughout the play. The impulse to love and the impulse to kill exist side by side for cat and coyote, and for Gabriela and Benito. At Single Carrot Theatre, director Steven J. Satta’s production felt a bit choppy at the first preview. But perhaps that’s intentional. Life is anything but smooth in the world Rivera establishes. Jessica Garrett portrays Gabriela as smart, lonely and conflicted. Satta has double-cast Kaveh Haerian as the Moon and as Gabriela’s husband Benito. It’s an interesting concept that the actor capitalizes on to illuminate characteristics of both. The constantly changing moon is a foil for Benito, whose love for his wife never changes, although his experiences on the battlefield change – and threaten -- their marriage. The set for “References to Salvador Dali Make Me Hot” is bisected by a double yellow line, representing the highway – and whatever divides us. In Single Carrot’s challenging production, it’s up to the audience to decide whether this troubled husband and wife can overcome what divides them. About a dozen blocks south, at the Theatre Project, “Fortune’s Child” is a more conventional domestic drama. Playwright Mark Scharf focuses on familial love, specifically, on a widowed father, his 18-year-old daughter and her dying aunt. Over the years, Scharf has become one of the most prolific playwrights in the Baltimore Playwrights Festival. His world premiere at the Theatre Project is presented under a special showcase arrangement with Actors’ Equity, the professional actors’ union. This raises the level of talent – and expectations. And, director Yvonne Erickson has assembled some gifted actors – particularly a relative newcomer named Kathryn Zoerb, who plays the daughter, a young woman torn between love for her dad, played by Lance Lewman, and attempts to distance herself from him. Lewman’s character has lost his wife to cancer, which is about to claim the life of his sister. But though his character is a psychologist, he’s having trouble dealing with another kind of loss – letting go of his daughter, so she can lead her own life. The core of the play, however, is the relationship between the daughter and her aunt -- touchingly played by Marianne Angelella as a free and loving spirit. The most buoyant scenes depict their travels around the globe. But too much of the play consists of short scenes, often separated by blackouts. Structurally, “Fortune’s Child” feels more like a made-for-TV movie than a piece of theater. Scharf also tends to overwrite and repeat cliched statements and ideas: “Sometimes the best thing is what hurts the most,” or, “Nothing is fair on this earth unless you make it fair.” “Fortune’s Child” includes some much-needed humor, and the characters do change, grow and learn to let go, but there’s a theatrical spark missing.